When I arrived at Chelsea, Dad sat alone in the tea room reading the paper. He didn’t hear me approach. I watched as he stared at the paper as if he couldn’t focus on the words. I waited, watching his determination to grasp a bit of what might be going on outside of his narrowed world. Almost two minutes passed before he saw me standing beside him. His face lit up and he came to life again. 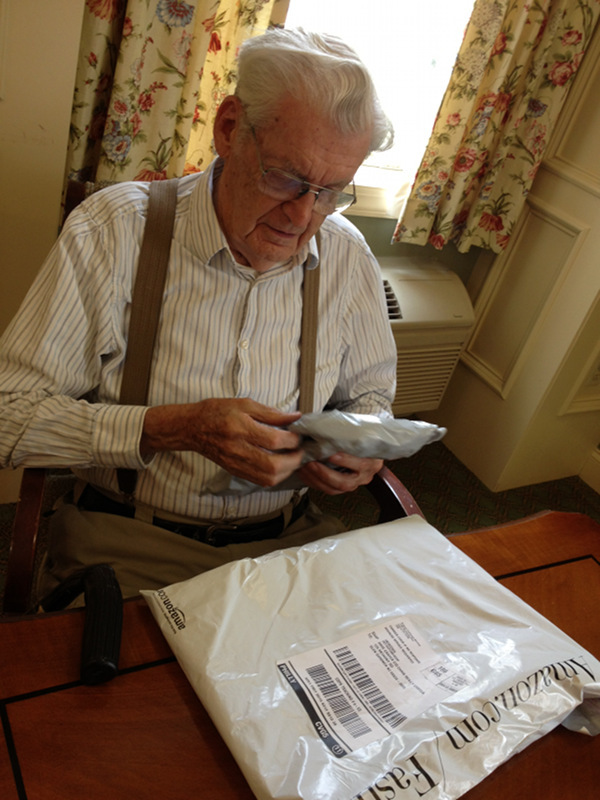 I handed Dad the two Father’s Day packages that had arrived at my house from Louise and Dave. 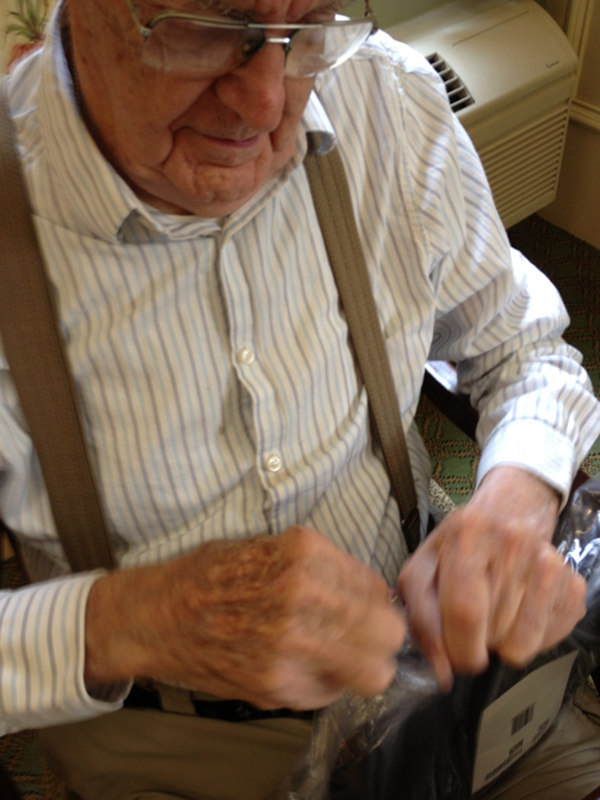 After explaining that they were Father’s Day gifts, he began to open them…. at least he tried to open them. Packaging has changed over the years. The adhesives have gotten stronger and the plastics have the ability to stretch like salt water taffy. 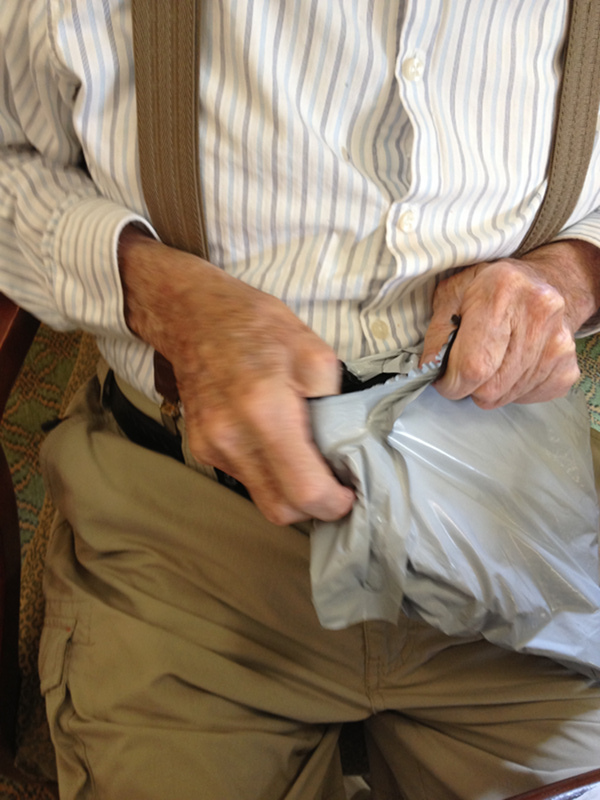 He thought he had it…… but no…….after a great deal of struggling, Dad was able to open a large enough slit to reach his hand in, grab the bag inside of the bag and pull it out through the slit. The bag inside the bag was just as difficult to open. Dad does not give up easily. 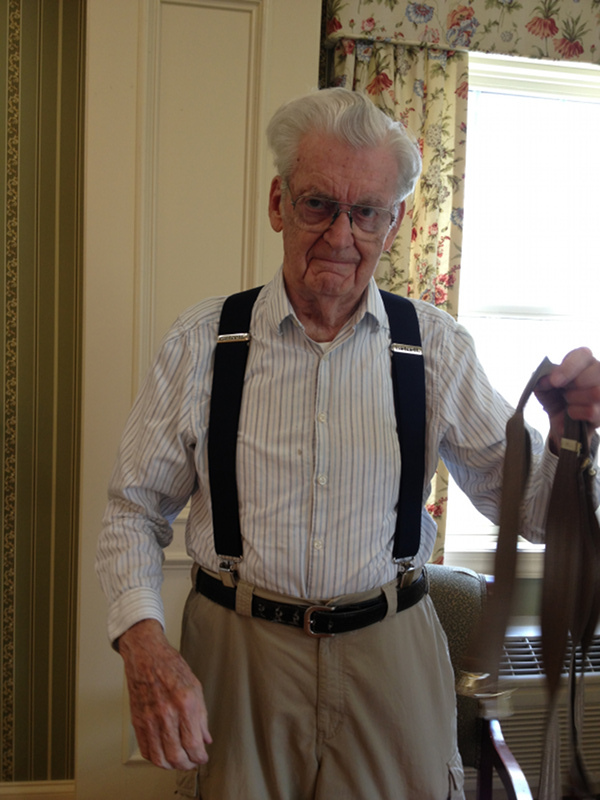 Eventually, a new pair of navy suspenders lay in his hands. 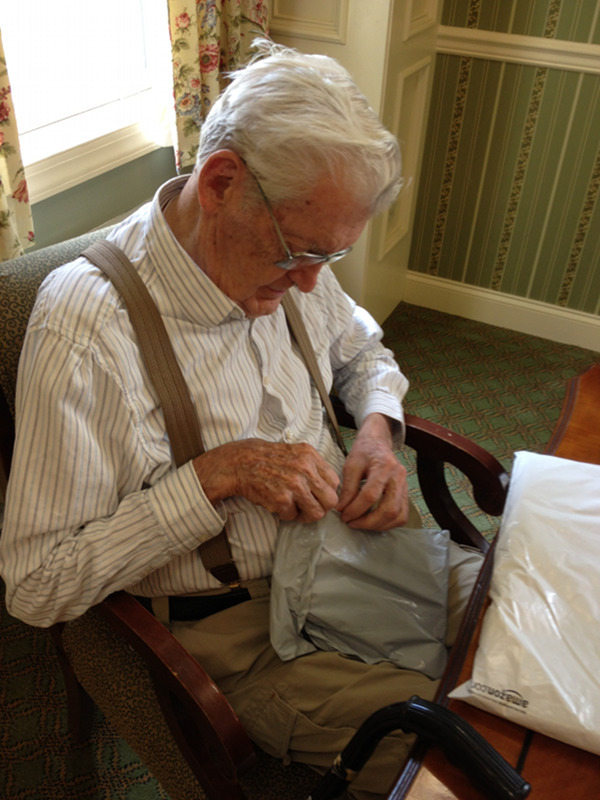 He switched his old for his new and sat back down to tackle the second package. 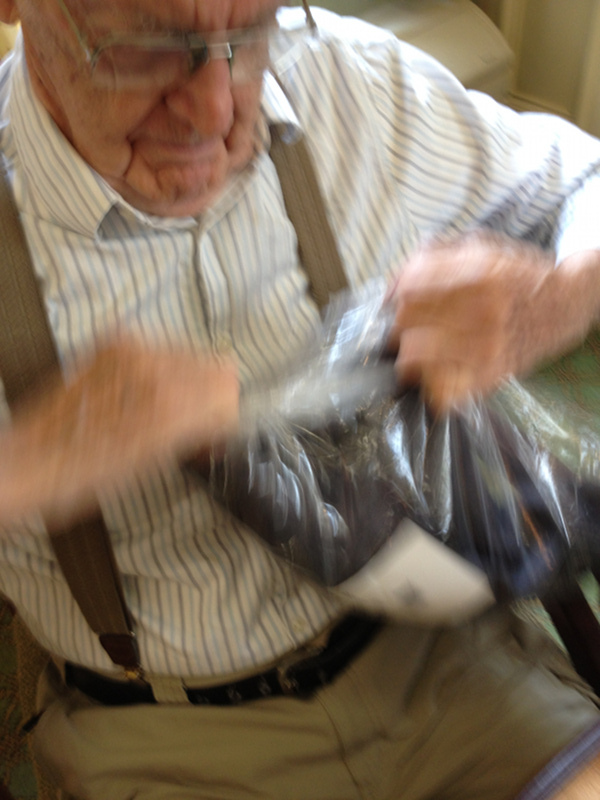 The experience was the same as with the first package….. but now he was a pro. I think you get the picture. 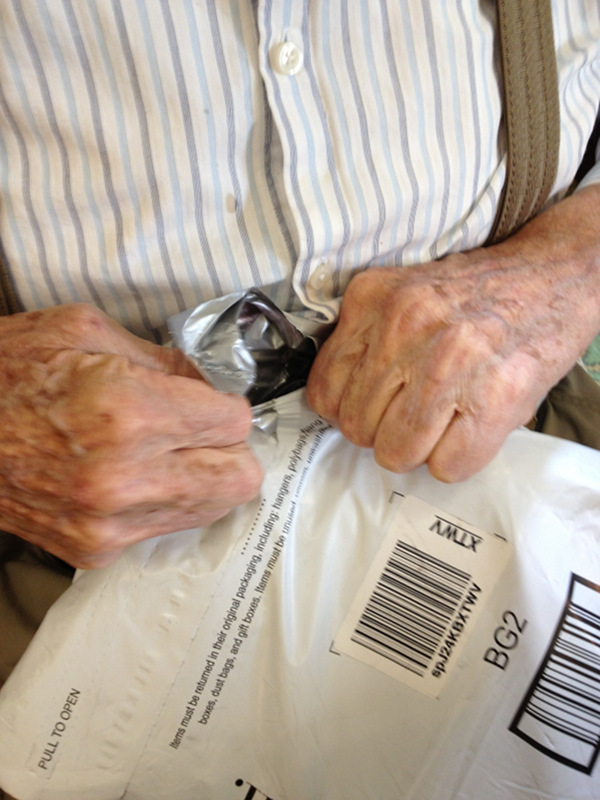 The only difference was that he finally allowed me to help by slicing through the bag with my pocket knife. After a quick stop to his room, we headed to Hofheimer Grotto. 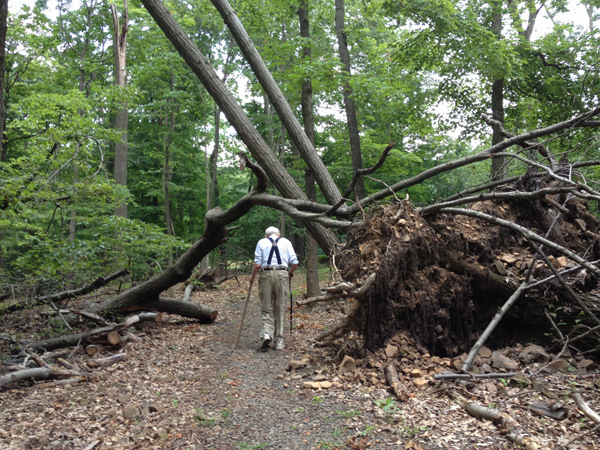 We hadn’t been able to walk the paths after Hurricane Sandy. Too many trees had blown down, blocking the trails. I hoped that they had been cleared by now. 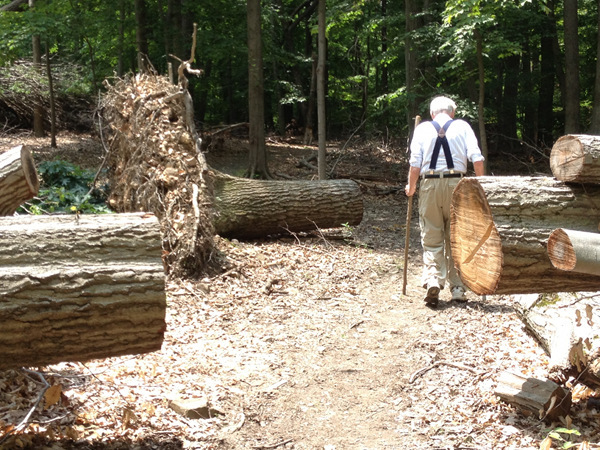 Dad hardly noticed the fallen trees or the huge chunks that had been cut from them so that the trails were clear for walking. Dad just kept walking, focused on his footing and balance, oblivious to the state of the forest. There was a time, months ago, when he talked non-stop about the trees either growing straight and tall or bending due to the wind and sun. Here they were, his beloved trees, strewn about like pulled weeds left to decompose in the sun and rain. Dad said nothing, he just kept walking. 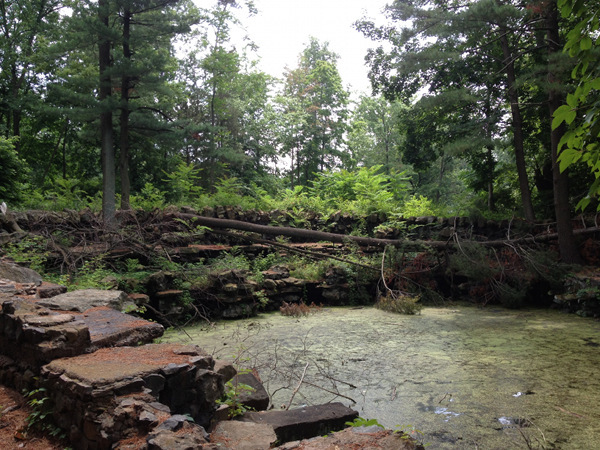 The Grotto was in shambles. I felt my cheeks wet. I remembered the first time Dad and I walked here and discovered the grotto, a hidden treasure, an architectural wonder, surrounded by majestic pines. Only a few of the pines remain. The rest fell into the murky water, knocking stones and boulders down with them as they fell. the grotto had changed and so had Dad. I didn’t want to linger. 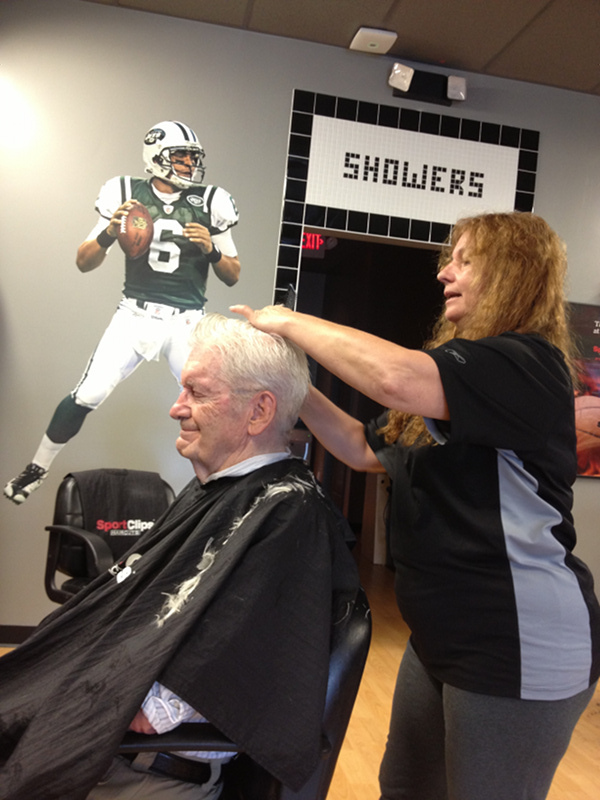 As a change of pace, as well as to distract me from my grief, I decided to take Dad for a haircut. I don’t usually think of it and I didn’t think it was right to leave the haircuts for Jane to handle. I wanted to surprise her…… and that I did. It turns out that she had taken him for a haircut just last week! Next time, I’ll take him to Sal’s in Martinsville. A sports cut is not exactly what he needed. Sorry Dad… Sorry Jane. Back at Chelsea, I pulled the box of stationary out of my bag. 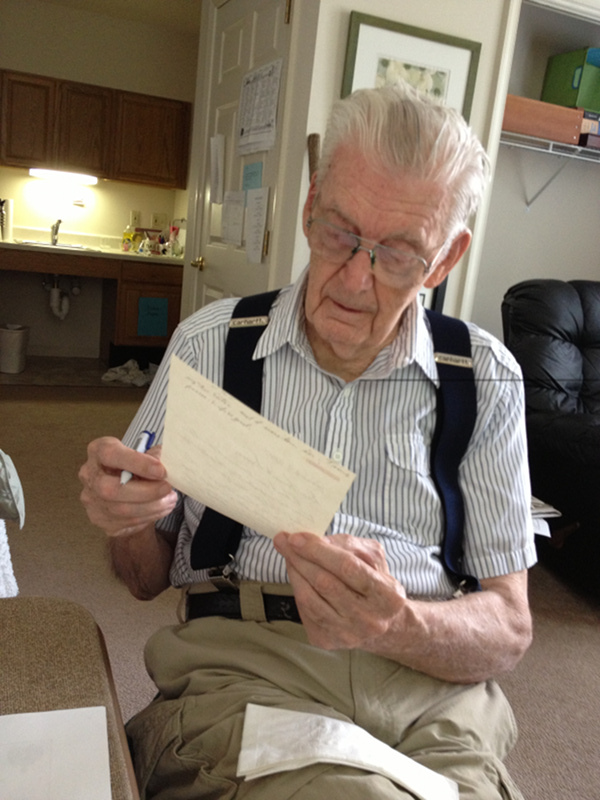 It has been a long, long time since Dad wrote anyone a note, addressed an envelope, put a stamp on it and mailed it off to a friend or loved one. 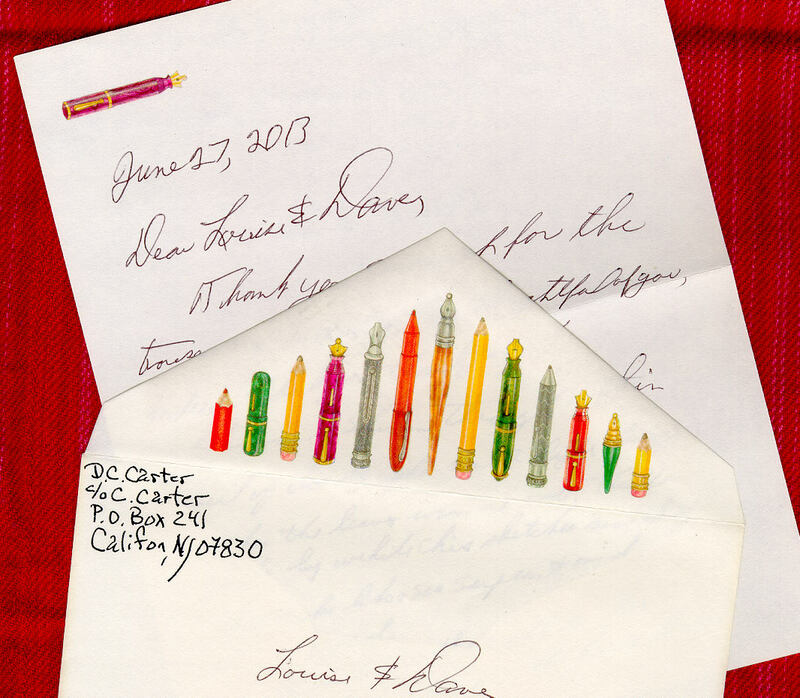 I thought I might help him write a thank you note to Louise and Dave. What is it I am writing about? 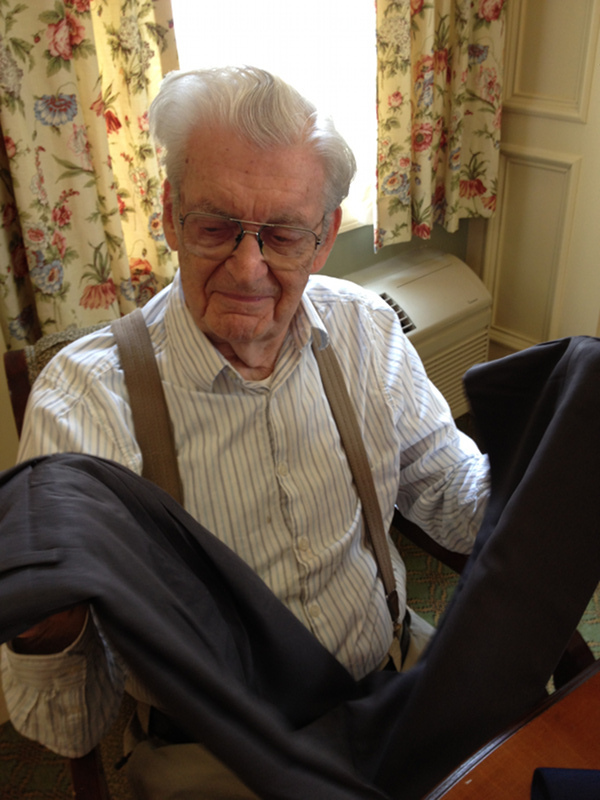 I showed him the new trousers. As you can imagine. Writing the thank you note was more of a challenge than I had anticipated. Eventually, the mission was accomplished. 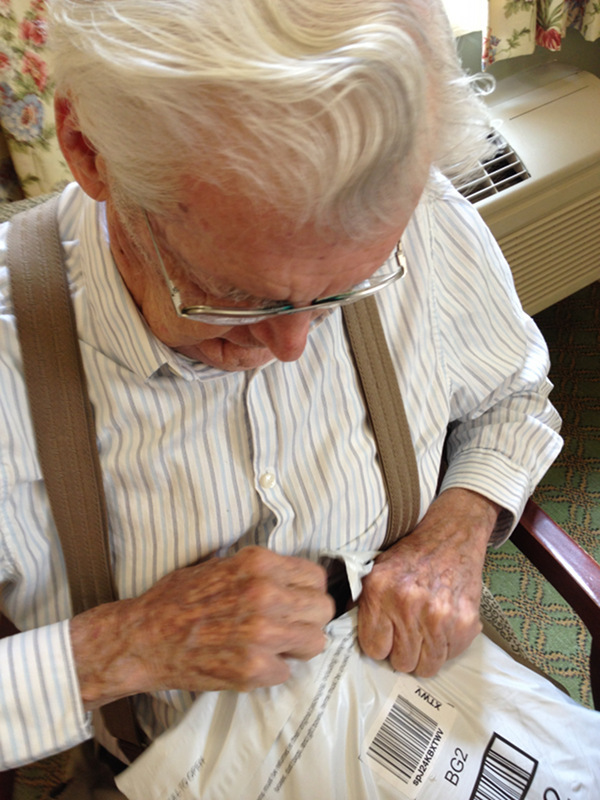 I decided to wait for another day to help Dad write a note to his friend, Daisy Horn. I’ll post what he wrote next time. I don’t want to spoil it for Louise and Dave. Wondered where those great suspenders came from! Today he wrote about a Fourth of July day as a boy. Happy Fourth everyone!!! Love the Fourth of July Fireworks story, Jane. I’ll post it on the Fourth of July! Thanks. So sad about the grotto! Thanks for posting this, Chris. Dad and the blown-down trees is such a powerful image. I can’t get it out of my head. The suspenders look too heavy-duty to me, especially since Dad wears a belt too! And it looks like they could be loosened a bit. I checked lots of different suspenders, and these looked like they should be comfortable for anyone shorter than 6’3” or 6’5”. I hope that’s true. We saw John Prine at ZooTunes the other night, and I couldn’t help thinking about Dad when he sang “Hello in There.” Click here for a much younger John Prine singing it: http://www.youtube.com/watch?v=RfwGkplB_sY. It’s accompanied by photos. The one with “old trees just grow stronger” also reminds me of Dad.